It’s been awhile since the last blog carnival, which beyond their promotional character (read: circlejerking if you prefer) they also help us get to know more about each other. Some weeks ago our friends on facebook started making top10 influential lists; it started with metal band albums and spread to video games to manga and anime. So we thought why not? Diary of an Anime Lived focused on anime that echo our real lives; ‘The impact they had on us’ seeks to pinpoint the anime or even manga titles that aren’t just a mirror of us or even our favorites but to highlight these stories that changed the way we viewed the world. The seven angels and the seven seals. At the millennial edge, the concluding battle for humanity’s future is staged. Kamui Shirou’s destiny has been decided as he returns to Tokyo to face his ultimate challenge. The Dragon of Heaven, defenders of the Earth, stand ready to protect the world from the Dragon of Earth, the seven angels of legend, who embrace the devastation of the planet to bring about its purification. Now Kamui must decide which side to fight for although he finds the idea utterly unappealing. It isn’t until realizing that his two childhood friends, Fuma and Kotori Monou, are in grievous peril that Kamui decides to step into his fated position in the climactic struggle of the Year of Destiny: 1999. 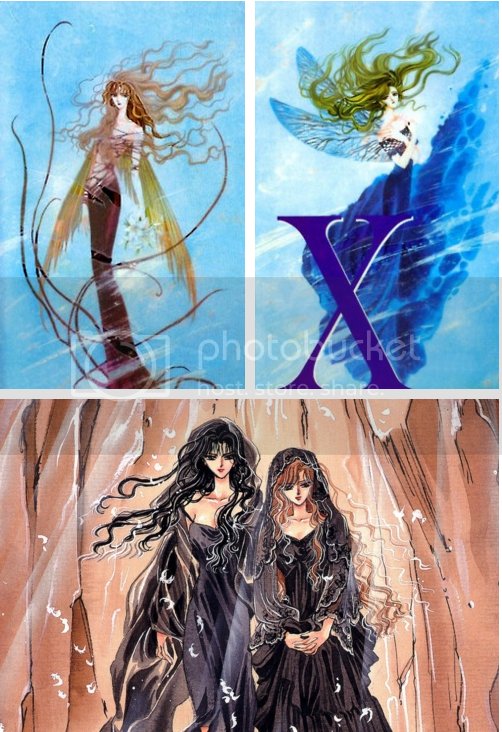 After I got into CLAMP fandom, I started exploring the various manga out there and of course X, being the masterpiece it is, wasn’t left out. It must have been while I was still in high school and I wasn’t that aware of the Internet communities out there or the streaming online – if I remember correctly. I was a newbie ‘otaku’. So when I read about Saya Monou turning into a mermaid in the afterlife as punishment, question marks started floating over my head. And I guess that I’m not the only one feeling puzzled about this fact, if we take for granted the strong influence of Disney’s The Little Mermaid adaption of the homonym fairy tale in the West. This article is my attempt to explain the imagery associated with Saya Monou. For those who haven’t read X or haven’t seen the anime, I shall clarify some things. Saya Monou is the mother of Kotori Monou, who we see above, and Fuuma Monou. She was in love with Tohru, Kamui’s mother, ever since she met her back in high school. Saya possesed dreamseeing power and even if it wasn’t as strong as her daughter’s, she saw that Tohru would have to bear the Shinken, the Holy Sword, for the Final Battle. So, she decided that she would take Tohru’s place and give birth to the sword, since Kamui would still be a small kid and if Tohru died, he would be left all alone in the world. The meeting of mother and daughter takes place in Kotori’s dream, just after the latter witnessed the birth of the second Shinken, and was reminded of her own mother’s death. 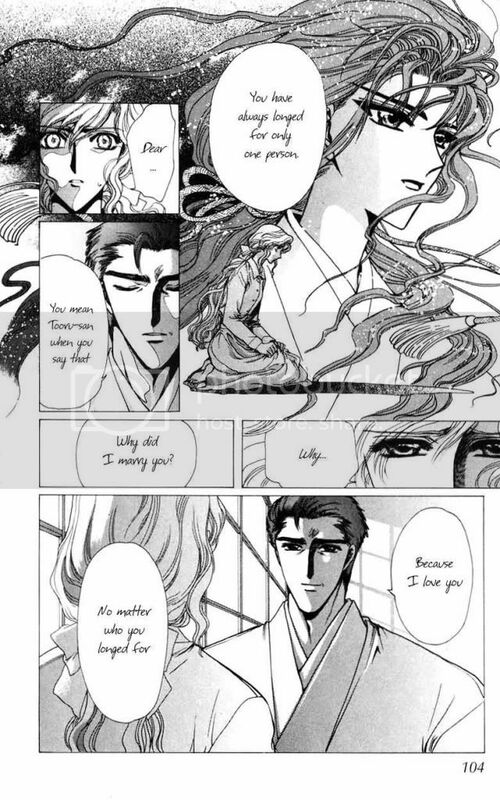 Saya explains Kotori how she married into the Togakushi shrine in order to fulfill her wish to let herself sacrifice for the person she loved. Later on, we get more insight of Saya’s final moments and her relationship with her family and Saya through Hinoto-hime’s dream, which she shows to Kamui, who had come to her with questions. In those flashbacks, we hear Saya’s thoughts about the course of actions she took, and also her dutiful husband, who knew all along that he wasn’t Saya’s special one, saying goodbye before her body is torn to pieces (the Shinken destroys the body from which it came from). Kyougo: You are going to pass away, aren’t you? K: Is it for Tohru-san? I knew… from the time you first came to Togakushi. You have always longed for one person. K: You mean Tohru-san when you say that. K: Why did I marry you? Because I love you. No matter who you longed for. K: What are you apologizing for? You’ve been a good wife to me… and a good mother to the children. The question is: why did she turn into mermaid as a punishment? What is her sin? As I’ve already said, turning to Disney’s Little Mermaid for possible explanation is vainless, because of how the end got ruined for enjoyment’s shake – and they lived happily ever after. 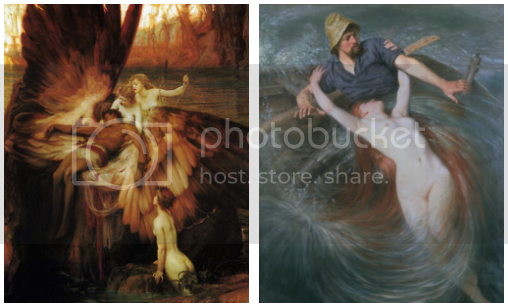 The original one has the mermaid committing suicide, turning into foam, since she denied killing the prince she loved and who chose another woman in her place. Her tragic end is what makes the tale meaningful. The Little Mermaid is, in other words, a fool who sacrificed a very important thing to her, to get a chance to be near her loved one. In the same manner, Saya is a fool, taking her beloved Tohru’s place, dying and leaving her husband and children behind. And on top of all that, it’s questionable, if Tohru reciprocated her love the same way. Saya might have been in an unrequited love, just like the Little Mermaid. 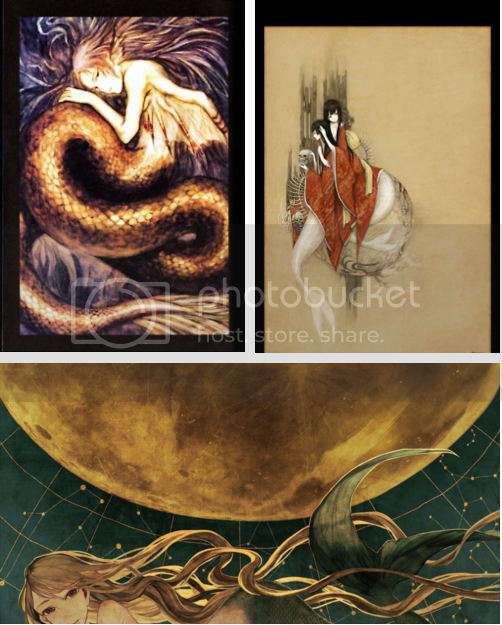 After all, Saya is placed on the Tarot card no.0, The Fool, for a reason. This connection though still fails to explain why the mermaid form is associated with sin. Let’s try scanning through mythologies… hm, ancient Greeks had a Gorgon (gorgona means mermaid in new Greek), named Medusa – the most famous one- petrifying men with the eyes of snakes she had as hair on her head; Perseus killed her. They also had the sirens, the ones with the alluring song, which lead sailors in their deaths; they are known from an episode in Odyssey. But they were depicted as birds with heads of women instead of half women half fish – this form is encountered later and has roots in other European countries. Anyway, these cases bare no physical similarity to Saya’s form and the only element that they share in common is their nature as ‘angels’ of death and deception. Saya’s death is the one that sets in motion the whole story and the events leading up to the upcoming ‘end of the world’. This includes Kyougo’s death, while trying to protect the Shinken, as well as her daughter’s death at the hands of the ‘other Kamui’ among the massacre that follows. 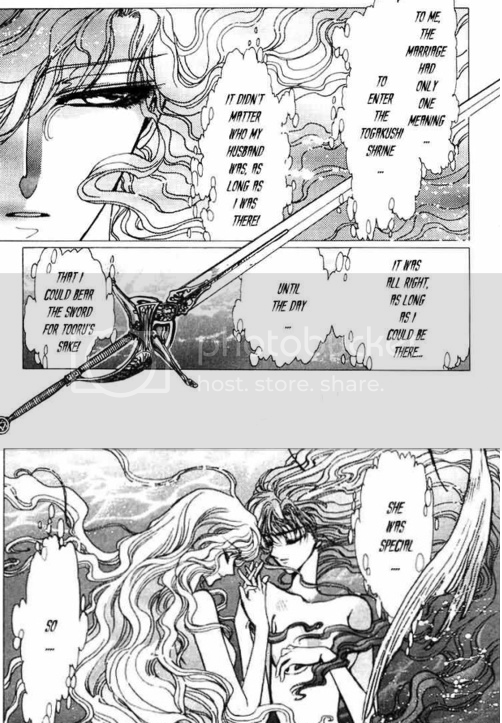 Again, there’s no reason to connect sin with a mermaid, because ‘their destiny was preordained’. As for the deception part, marriages without love aren’t that unusual in Japan. Even Kyougo didn’t blame her for that since she fulfilled her roles the way she should. In Japan silence and as a result, feigning ignorance or hiding the truth, aren’t considered a sin per se, because their culture puts respect and the bond of the group above all else. On the contrary, silence is considered gold. 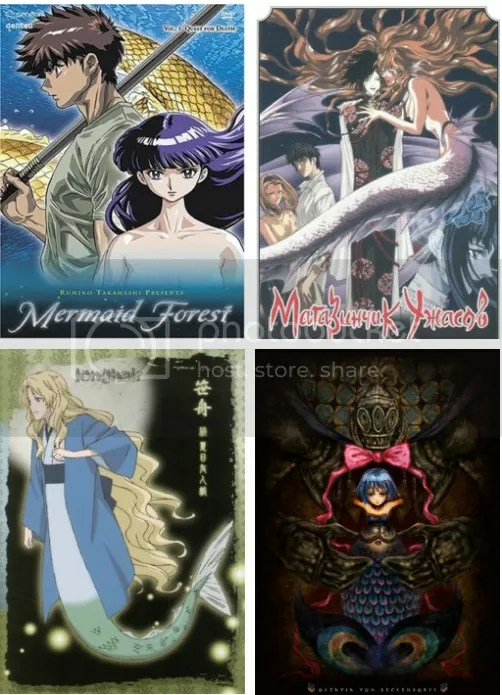 What about Japanese mermaids? They were pretty monstrous like their ancient Greek counterparts: with fish body and monkey’s chest and head. As the ages passed, they were depicted like fish with only a head of a woman, till they came to possess a more Western imagery. They have though longer (dragon-like) tails and way more fins with spiky edges compared to the Western mermaids. Ningyo are monsters whose flesh is said to make immortal whoever eats it. Ningyo themselves live for centuries. The theme of eternity may be found in Saya’s punishment, if we twist the things a bit. The question remains: what was Saya’s sin that turned her into mermaid? Even if we try digging up old anime and searching the more recent ones, we don’t get any useful clue. The motif of the mermaid as source of longevity is seen in both the more violent Mermaid Forest and in the gentler Natsume Yuunjinchou‘s Sasafune. In the Petshop of Horrors the form of the mermaid assumes a soul of a woman who wants to take revenge on her boyfriend who cheated on her, and in Puella Magi Madoka Magica Sayaka turns into a mermaid because of her anger and sorrow coming from having the boy she rescued ‘taken’ by a friend of hers (Little Mermaid here again). All this time we are overseeing two important facts: the physical nature of the mermaid and the relationship between Saya and Tohru. First of all, the traditional image of a mermaid is one of half fish, half woman. This actually means that she doesn’t have the usual sexual organs a human being has and of course she can’t reproduce, she can’t make human children. Secondly, we know that Saya loved Tohru in a sexual way, more than just friends – this should be clear from the dialogues in the beginning of the post. On the other hand, we aren’t sure about how Tohru saw Saya and the two of them aren’t shown sharing any physical contact, even a hug or a kiss. But, Tokiko, Tohru’s sister tells Kamui that Tohru run away from home carrying ‘the child of a Man for the shake of the Earth’ but not even Kamui knows a thing about his father. Not staying or keeping contact with the man she got pregnant with could be interpreted that Tohru wasn’t interested in men. Her choice of spending quite some time in Saya’s house, letting their kids play, should be taken in account, too. 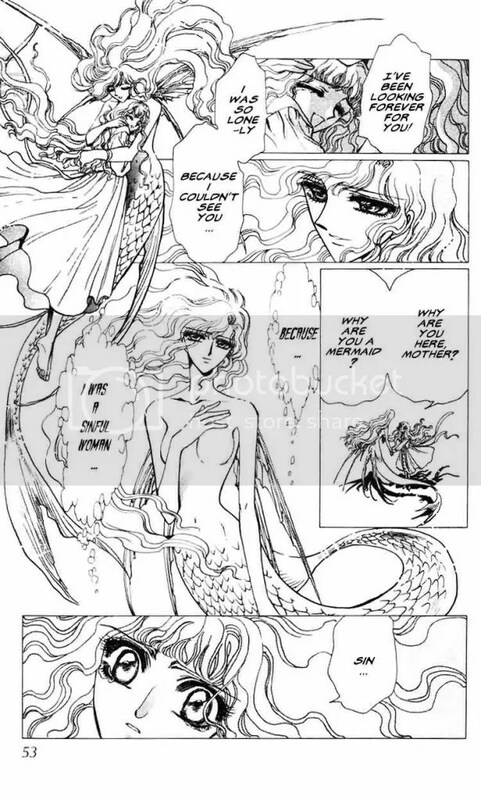 And then we have the illustrations; Tohru is also drawn as a mermaid, holding a bouquet of lilies (yuri in Japanese). The matching illustration of Saya depicts her as some water sprite, folding her hands on her chest, like embracing herself and perhaps saying in this way ‘I love you’. Saya’s royal blue dress and Tohru’s maroon fish tail contrast and compliment each other, stressing their close relationship. The sole illustration where they are featured together is a simple one, setting them alone in a cave, with light coming from the opening of the cave and feathers floating down. They stand atop of a rock near each other, wearing black dresses and head covers, staring at the same diagonal direction. It’s harder to decode the possible hidden symbolism here, but I can say that the cave, as it appears, resembles a nest in my eyes. Caves were the first shelters of human beings and are also the place where families started forming. Under this light Saya and Tohru can be seen as family. Or cut off from the rest of the world, living in a world of their own. Where do I want to lead this train of thought? See the image below. Also known as Friends I, they are clearly not serpents, sprites or nymphs, but a half naked lesbian couple writhing in orgasmic ecstasy. Lesbians are portrayed as ‘water snakes’ or mermaids. Why? Because two women can’t reproduce together. Their love is ‘fruitless’, it is left ‘unfulfilled’. As such, Japanese society (and not only) faces homosexuality as a sin. If we put all of the later information together with the illustrations and Klimt’s painting, we get our answer. This is Saya’s sin: the nature of love she had for/with Tohru. And that’s why she turned into a mermaid. Super-duper awesome Yi from Listless Ink offers me one more time the pondium on her brilliant blog. Check it out!